Attention statistics nerds! This might be right up your alley. Got an email from a lovely fella last week asking if we would like to be included in his infographic on the top 50 Food Bloggers in Australia ... An offer I gladly took him up on. 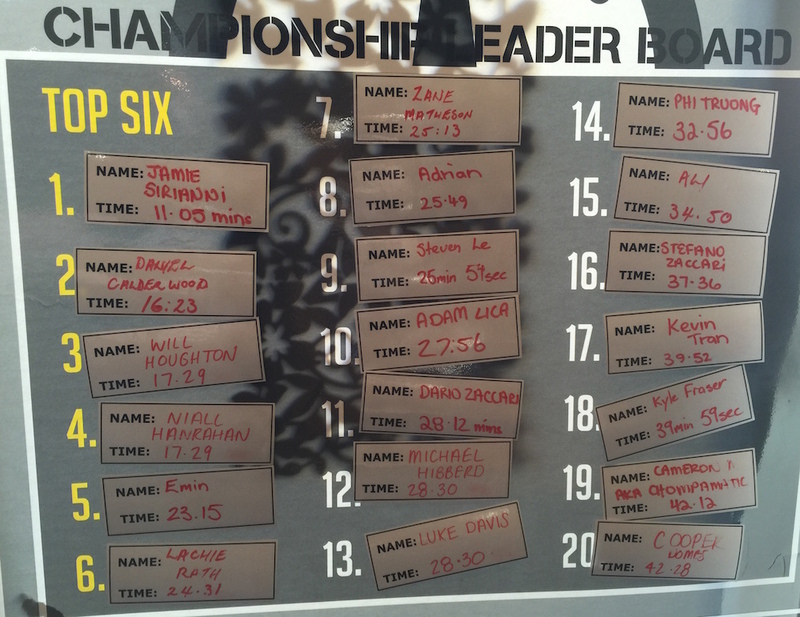 We squeeze in at number #44 - To be honest I reckon we should be in the #1 spot, but I may be a little biased. So have a gander below and see what you think. Thanks to Leon for the hard work! And make sure to keep an eye out for a new review up Friday. It's a debate as old as time. Well, a debate old as chicken parmigiana anyway. Not a week goes by that I don't log onto Twitter and see one or two people hurling insults back and forth over one question... Is the proper slang term for a chicken parmigiana "parma" or "parmy". Quick side note - by "Parmy" I am referring to all spelling variations of that pronunciation , be it parmy, parmi or parmie. Even my brothers in arms, the other parmigiana review sites around the country, can't seem to agree. 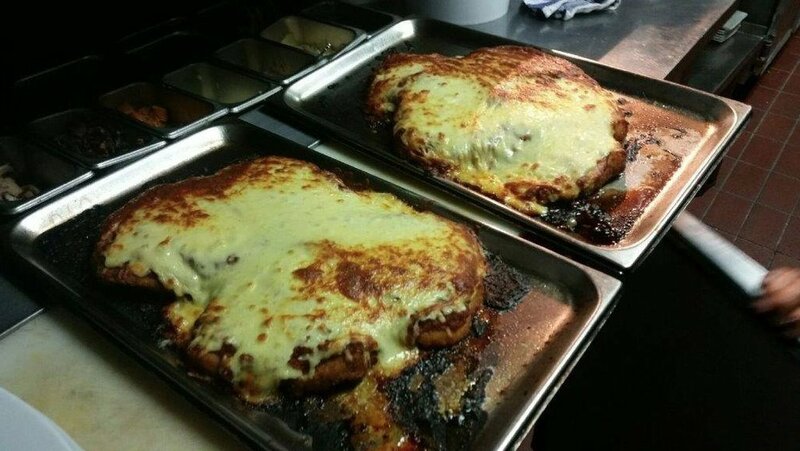 We've got ParmiHunter and Brisbane's Best Parma Queensland, All The Parmis and Parmys of Perth in Western Australia, Chicken Parmi's of Darwin and ParmasofMelbourne. It's enough to make your head spin. The problem seems to come down to one thing - Should the slang term be based on how you say parmigiana or how you spell parmigiana. The standard Aussie dialect would pronounce it "parm-A-gee-arna", yet the word is spelled parm-I-giana. And that difference in opinion is pretty much the entire kerfuffle in a nutshell. From what I've seen its a very regional thing. South Australia and WA arepro-parmi yet over here in Victoria we are team parma (with the exception of Geelong, for some reason). Sydney is a pretty firmly on the fence and Tasmania take the odd route and often refer to it as a "schnitzel with parma topping". Last week I put the word out on social media (Facebook, Twitter and Instagram) and I asked the question - What do you say and where are you from? CRAP. THIS IMAGE GOT LOST IN THE SHUFFLE TO SQUARESPACE ... PLEASE REMAIN CALM WHILE I FIND A BACKUP! Pretty much as I expected! Would have loved to get some more votes from states other than Victoria, but what are you gonna do? So there really is no right or wrong in this debate. But this is the internet, a device that is seemingly designed for pointless arguments - therefore if you would like to weigh in with your opinion I have opened this post up for comments below. As Shakespeare said "A rose by any other name would smell as sweet", and a parma, by any other name would still taste as delicious. First up - Apologies but there'll be no new review this week, It's not often that this happens but we just weren't able to get to a pub, So what better time to trial a new type of post for the site! Welcome to "Chicken Scratch", a post that isn't a review but a place to discuss other stuff in the parma world. Think of it like an open letter - and feel free to make liberal use of the comments section at the bottom. It's probably the most common criticism I see whenever I post a picture of a parma or new review. It's probably the most common criticism I see of parmas period. The parma is on top of the chips. Its something I don't mention in reviews a lot, as I feel like if I did it'd be all I talk about - So lets get it out of the way, lets air our opinions on the matter in one fell swoop - For something a little different this week I'm going to take a look at why this very common practice annoys people so much, does anybody like it? Why do they do it? And maybe finish things off with my opinion on the matter. So many comments. Click here if you want to view them all (big image). But the basic gist was that people hate the parma on top of the chips. The general reasoning as to why is that it 1)Makes the chips go soggy, and 2)Makes the parma harder to cut, or that you lose chips onto the table while trying to manoeuvre the parma around the plate. There were a few people that weren't big fans, but accept that its a necessary evil and a very small minority that actually prefer their chips soggy (I'll get to them later). So if we all hate it so much, why do they do it? Now I'm not a chef so this is all speculation on my part (If there are any parma chefs reading this feel free to chime in on the comments section below). But I would have to say the biggest reason this is done is simply lack of plate size. We all want a big parma, we all want lots of chips and we want a tasty salad (well, some of us want a tasty salad, a lot of readers don't give two shits about the salad... but I like it) and there just isn't enough room on the plate to fit all that food unless you either stack the stuff up or incorporate some sort of TARDIS style "bigger on the inside" technology to the crockery. 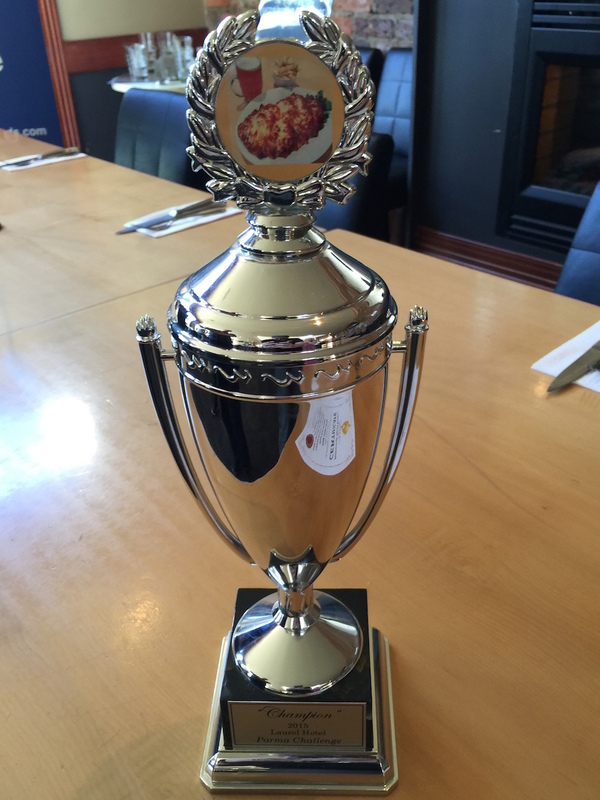 But thats why The Imperial keeps bringing home the Golden Chooks - They do things right. In fact, would you care to venture a guess of how many pubs, out of two hundred and twenty one parma reviews over five years, bothered to serve the chips in a bowl/basket? Yep, seven pubs. Out of 221. Well, lets be generous and make it eight as the chips at Schnitz came in a paper bag, thats close enough. Why so few? My guess would be cost, its a lot cheaper if everything you serve fits on the same plate rather than having to worry about buying parma plates as well as plates for all your other food. Secondly have you seen the plates at The Imperial? They're friggin' huge! I feel sorry every time I see a waitress struggling to weave her way through a crowd balancing three car-door sized meals on her arms. Secondly I'd say presentation is a big factor - its hard to deny that when the chicken hits the table it just looks better if its propped up on something. 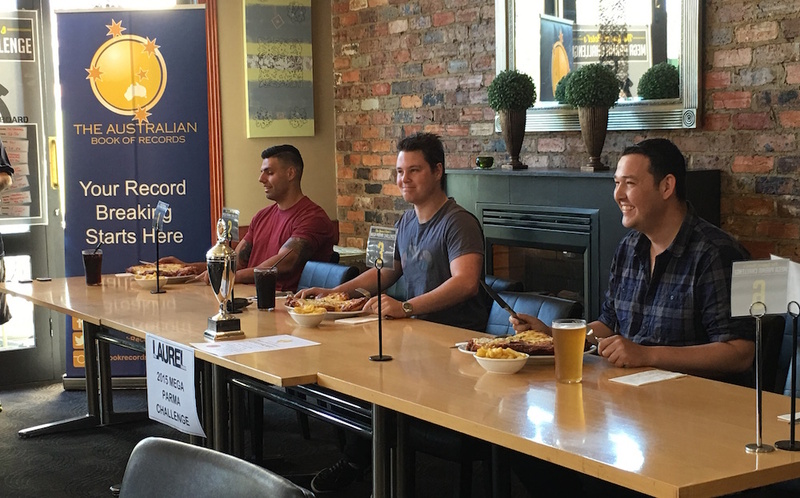 We all saw the (horribly ridiculous) article in the Herald Sun the other week about parma's not being "pretty enough" for Instagram - well stacking the parma up definitely helps it look more Instagram-ready than it laying flat on the plate. So they are the only reasons I can think why this happens, Like I said its all just speculation - If anyone knows for sure feel free to clue us all in down below. The juices make the chips juicy, fat chips are better when they are moist. Skinny chips, the crispy ones, are better - But Jimmies chips (see Our Story) used to be great when they absorbed all the juices. The crunch is great for a skinny chip, but a fat chip is steamy and moist anyway - it's like stuffing or mashed potatoes. It absorbs the juices and makes the chips even more delicious. Not all of the chips, but some. I have to say, he makes some good points. A Reddit user also brought up a good point about loaded fries (you know, when they treat chips like nachos and cover them in all sorts of stuff. Chilli cheese fries, curry cheese fries etc...) Which are pretty much all soggy to the point that you need to eat them with a fork. Could there be a correlation between lovers of soggy chips and lovers of loaded fries? I may anger a few people here, but to be honest I don't think its that big of a deal. I don't like it, and of course I would prefer my chips in a separate bowl as opposed to getting squelched underneath, but it doesn't bother me that much - When you eat as many parmas as I do its one of those things that you just learn to accept - sure a separate bowl is nice, but when only 8 out of the last 221 parmas I've eaten have done so I've kind've become numb to it - Plus any parma eater worth his salt can expertly extract the chips from underneath the parma moments after it hits the table, thus avoiding any real damage. When it comes down to it all pubs in Melbourne aren't going to start stocking massive hubcap sized plates just for their parmas (well, with the exception of Maxy's), and if given the choice I would rather have a plate with a big parma and a lot of chips with a bit of stacking as opposed to a smaller parma and less chips with everything fitting on the plate nicely. But to each their own. Like I say, opinions are like assholes - Everyone's got them, and most of them stink. Disagree with me? Agree with me? Think its ridiculous that a grown man just rambled for over a thousand words about stacking chicken on potatoes? Post your thoughts in the comments below. I hope you enjoyed this little deviation, we'll be back with a fresh parma review next week. 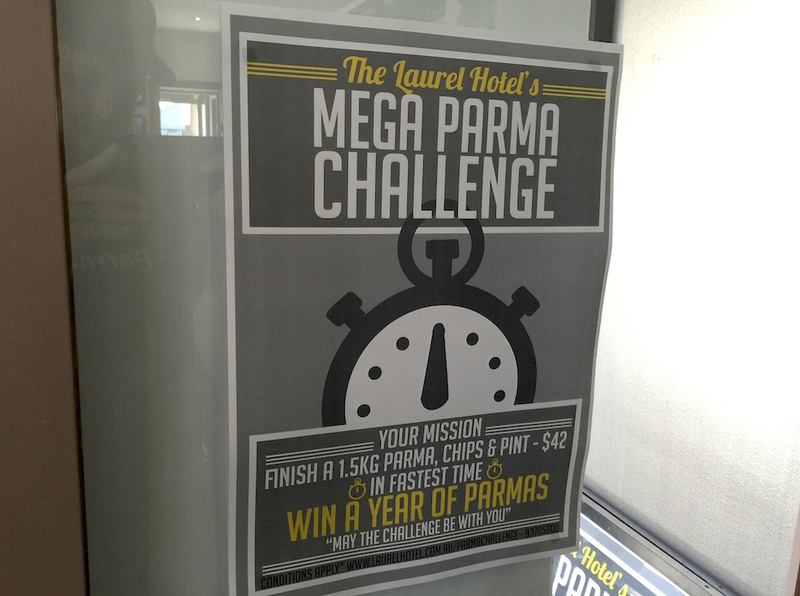 If this goes well maybe one day I'll tackle the greatest question ever to face the parmigiana community, the question that will divide us all and start a flame war that will last for decades... Is it Parma or Parmy?